Q. What motivated you to get involved in the martial arts? I was a junior in high school when I heard about Kung Fu through a friend of mine. Ruben Ramirez took me to a San Soo class in El Monte, which was being taught by Grandmaster Jimmy H. Woo. I was blown away. I liked what I saw in Grandmaster Woo and the philosophy he taught. I immediately began my training, until I joined the Marines and was shipped to Vietnam in 1966. I resumed my training with Grandmaster Woo in 1968. Jimmy became a father figure to me, as He poured himself into me, even apart from the studio. 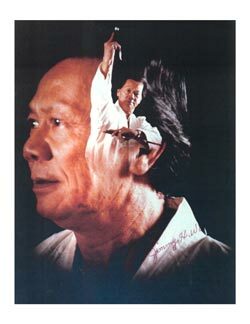 Upon receiving a Master’s degree in the art of San Soo, I opened my studio in West Covina, January 1983. Q. Do you still teach Kung Fu San Soo? Yes, I teach here at Calvary Chapel Golden Springs in Diamond Bar on the 2nd and 4th Monday of each month at 7:00 PM. All Kung Fu San Soo students 14 years old and up are welcome to participate in any of our classes for a mat fee of $20. Q. Does Kung Fu San Soo have a positive effect in your life? Yes, it helps me physically and mentally. I have gained confidence and strength through the study of San Soo. I have seen the results in my students as well. They have become more outgoing and socially comfortable. I have seen students come into my classes who are shy and introverted, and as they learn the art they become more social and more communicative. Q. What do you teach in your Kung Fu San Soo classes? Let’s begin with what I don’t teach, that is the mysticism and Eastern religion philosophy and practices which are associated with the martial arts. I teach San Soo, the fighting aspect of Tsoi Li Ho Fut Hung Kung Fu, with the physical and mental discipline essential to be the best you can be. There is also an emphasis on the morals and values held high by Grandmaster Woo, and by me as well. Q. Did Grandmaster Woo Teach the Eastern religion philosophy and practices associated with the martial arts? I was Grandmaster Woo’s student since the 60’s and from that time until his death February 14, 1991 he never taught the mysticism and Eastern religion philosophy and practices associated with the martial arts. He gave the name Kung Fu San Soo to the Art of Tosi Li Ho Fut Hung to emphasize the fighting aspect of the art. Q. You are a Pastor and also hold the degree of Master in Kung Fu San Soo. Do you see or feel any conflict between these two rolls? No, I don’t see any conflict at all, as long as you keep Eastern Religion out of it. I see my martial art as a gift and a talent from God. Just as a pastor who may ski or surf, I take what God has given to me and do it to the best of my ability. I have a desire to teach people not only self-defense, but confidence and how to become a better person. I don’t teach people to go out and fight others — but to have discipline. When I look at the martial arts, I look at it as a stepping stone for evangelism to people who aren’t open to a pastor and the Gospel. Q. How has your involvement in the Martial Arts been used for evangelism? People who don’t know the Lord will come and take Kung Fu San Soo lessons from me. It is through this relationship with my students, they approach me with their family and personal problems. The answers to these problems begin with a relationship with the LORD. I use the opportunity to share the Gospel with them. Some of them come to know Christ and some of them don’t. My experience in the martial arts has opened doors for me to reach people and places where no one has reached before. I can relate to the people who are involved in the martial arts. I have gotten to know people through the Martial Arts such as Ed Parker, Chuck Norris, Donnie Williams, Mike Stone, Gerald Okamura, Harry Wong and others — people who, normally, would not be reached by a pastor – it is through my involvement in the martial arts I have these opportunities. Q. Did your role as a pastor have any influence on Grandmaster Woo? Yes, I had the honor of leading Jimmy to the Lord, two weeks before his death on February 14, 1991. I was asked by his family to do the funeral at Calvary Chapel Costa Mesa on Tuesday, February 19, 1991. I’m still close to his family and love them with all my heart, his wife Bernie Woo, his daughter Evelyn and grandson James King.